Beautifully remodeled 3BD, 2BA, plus loft, 1 Car attached garage & 1 private space, corner unit. Owner has given this the love and attention that shows in every corner. Brand new floors throughout all first & second floors, stairs included, done with a "reclaimed wood plank" look, 3rd floor redone w/ brand new beige, low profile, upgraded carpet. New baseboards, new paint, new kitchen counter tops, sink, garbage disposal & faucet, accented with an elegant subway tile backsplash all adorned with stainless/black appliances. All existing & newly added recessed lighting has been done with efficient LED lighting & new dimmer switches, new NEST thermostat & keyless front door entry. New window coverings, newly added loft storage in garage & new super quiet, belt driven, garage door opener. Secondary bath has been remodeled with new commode, new efficient LED light fixtures & entire new vanity, sink, fixtures & mirror, giving this bath a fresh, modern & bright appearance. Owner has also replaced all angle stops & most all wall plugs & wall switches, leaving little else to do for new owners except, decorate with their own flare & move right in. Unit has a fantastic front location in complex, for easy, convenient parking & access for guests. 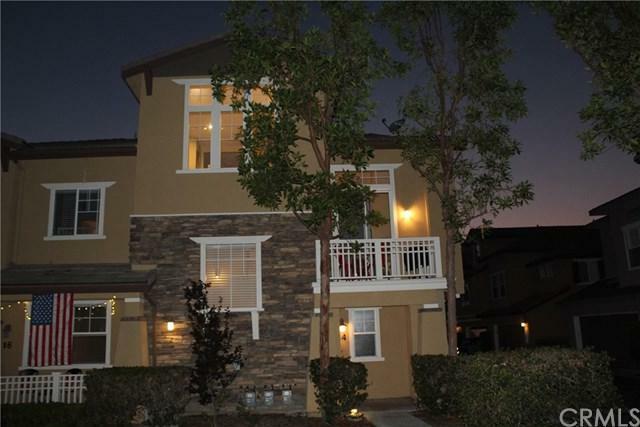 Very close walking proximity to Starbucks, Albertsons, CVS, various restaurants & shops at The Bridgepark Plaza, all located in beautiful, award winning Ladera Ranch. Sold by Margaret Weston of T.N.G. Real Estate Consultants.